One of the biggest differences between individual investors and professional portfolio managers is how they view performance. Individual Investors tend to overvalue short-term performance, placing too much emphasis on one, three and five-year returns. Professional portfolio managers place most of their analysis on seven to 10-year periods, since they coincide with a full market cycle. This is a marked difference and it can greatly change long-term results. To view how significant the differences can be, let’s take a look at 20 years of past performance. We will start by looking at the diversification chart below, which shows how various asset classes have performed. 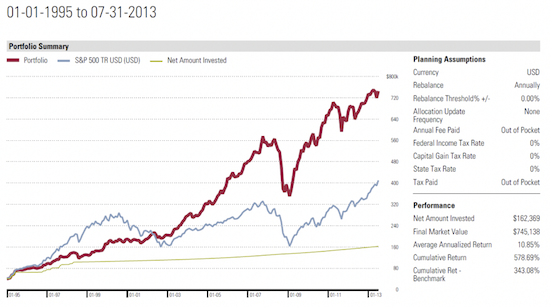 (The S&P 500 is represented by the category large growth stocks). Notice that over the short-term, during 1995-1999, the large growth stocks category grew approximately 38%, 23%, 36%, 42% and 29% per year. 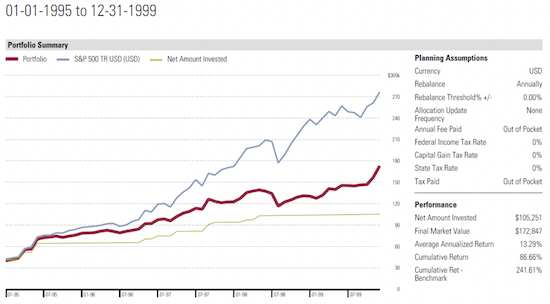 Monetarily, if you had invested $100,000 in 1995, by the end of 1999 you would have had $407,078. 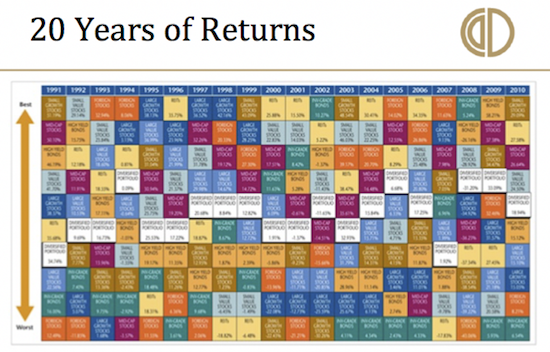 Many individual investors reaped such rewards and in 1999 they focused on the previous one, three and five-year time periods, making their performance look stellar, which enhanced their investing conviction and increased their expectation of their future results. Let’s dig a big deeper into the 1995 to 2002 story to see how choosing a proper time period for performance evaluation can influence results. 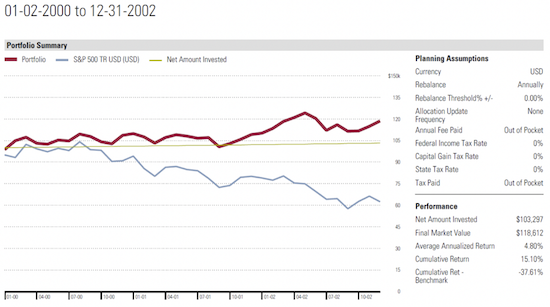 However, long-term investing is not a five-year story, so let’s look at how the two investing styles faired when we add a few more years of data. 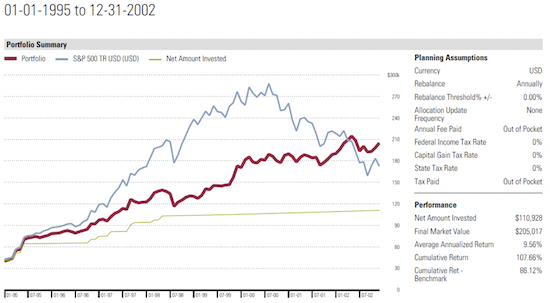 During 2000-2002, the S&P lost -37.16%, while the globally diversified multiple asset class portfolio actually grew 15.10%. Maybe asset class diversification isn’t dead after all. To further illustrate this point, let’s look at how the S&P 500 would have fared against a globally diversified multiple asset class portfolio from 1995 until today. The data below teaches us an important lesson. The diversified portfolio returned 578.69% (with much less risk and volatility) while the S&P 500 returned 343.08%. But like today, many investors during the bull markets of 1995-1999 lost their way and traded in a prudent long-term strategy for short-term mania. This caused many individual investors to take on excess risk while simultaneously suffering long-term under-performance.